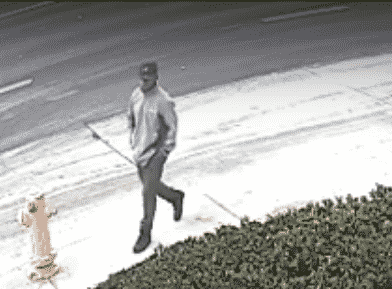 Long Beach police are trying to identify this man in connection with a sexual assault near Long Beach Boulevard and Pacific Coast Highway. Long Beach police today asked for the public’s help identifying a man suspected of attacking and groping a woman on Feb. 26. The woman was walking at around 7:15 a.m. in an alley near Long Beach Boulevard and Pacific Coast Highway when the suspect struck her on the back of her head with an unknown object and “proceeded to ‘body-slam’ her onto the ground,'” police said. Police said the man then reached underneath her clothing and groped her breast. The victim later got medical attention for head pain, according to the LBPD. Police have released security-camera video of the suspect. The man is described as Hispanic and in his 20s with a thin build. He was wearing a burgundy baseball cap with a diamond stitched on the front. The victim described the diamond as a “wedding diamond.” He was wearing a gray jacket with black on the sides, dark-colored pants and black shoes. Anyone with information should contact Det. Adriana Jaurigui at 562-570-7372. Anonymous tips may be submitted through Crime Stoppers by calling 1-800-222-TIPS or visiting www.lacrimestoppers.org.